Amelia and her new friend Casey are both struggling to enjoy their spring vacations due to family strife. For Casey, who is visiting his aunt, the problem is his parents' impending divorce, to which he vehemently objects with a variety of tactics, including homemade anti-divorce tee shirts. For Amelia, the superficial problem is that her father, the Professor, wouldn't take her to Florida for Spring Break, but this complaint masks Amelia's overall unhappiness with her father's standoffish demeanor, and her wish for a more permanent mother figure than her babysitter, Mrs. O'Brien. One day, Casey sees a woman on the street and creates an imaginary backstory in which this stranger is Amelia's mother. Though Amelia knows her mother died when she was young, she still entertains the idea that perhaps there is a connection to this unknown woman. When the woman's identity is revealed, however, Amelia is not sure she is prepared to handle this new knowledge. Like most novels by Kevin Henkes, this one is very quiet, with a melancholy and introspective mood. 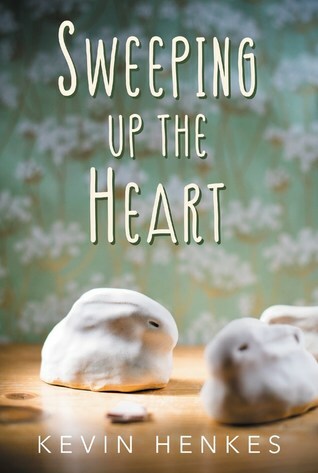 This story is very heavy with feelings of longing and disappointment, and though it is a short book, it doesn't seem to go by very quickly because it so laden down with these issues. The writing is quite nice, with simple turns of phrase that read a bit like poetry, but at the same time, very little actually happens which will certainly turn off more action-oriented middle grade readers. I'm really puzzled as to why this book has to be set in 1999. Aside from a few brief references to Y2K, there is nothing about the time period that really impacts the story. It is true that the characters don't have smart phones, which would certainly have changed the way Amelia researches her mother, but I'm not sure that is enough of a reason to set the story 20 years in the past. I liked this book well enough, but it's clearly not the most memorable middle grade novel I'll read in 2019. Personally, if I'm going to recommend a book about a father and daughter dealing with the loss of a wife and mother, it's going to be Remembering Mrs. Rossi by Amy Hest, and its sequel, Letters to Leo, which deal with many of the same issues as Sweeping Up the Heart, but with a slightly brighter outlook overall.